Milton Keynes is the fastest growing city in UK and an economic success story. However, such rapid growth is itself creating stress points in the city infrastructure – in particular in areas such as energy, water and transport. MK:Smart is an integrated innovation and support programme, bringing together academia, local government and industry, which aims to leverage large-scale city data to provide solutions to the aforementioned demand problems. Central to MK:Smart is the MK Data Hub, a state-of-the-art infrastructure which supports the acquisition and management of vast amounts of data relevant to city systems from a variety of sources. The MK Data Hub covers both open and commercial/private data and provides a generic enabling infrastructure, available to academia and business alike, enabling data-intensive open innovation. In this talk I will introduce the MK:Smart project and the MK Data Hub, focusing in particular on the issues associated with creating an open infrastructure supportinga heterogeneous data ecosystem and a data-centric approach to application development. 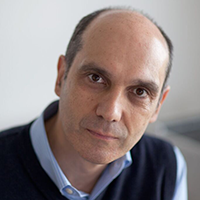 Prof Enrico Motta has a Ph.D. in Artificial Intelligence from the Open University, where is currently a Professor in Knowledge Technologies at the Knowledge Media Institute. In the course of his academic career he has authored over 300 refereed publications and his h-index is 59, an impact indicator that puts him among the top computer scientists in the world. His research focuses on large scale data integration and analysis to support decision making in complex scenarios. He is the Director of the MK:Smart project, a £16M initiative which aims to tackle key barriers to economic growth in Milton Keynes through the deployment of innovative data-intensive solutions in the energy, transport and water management sectors. He is also currently working on a novel environment for exploring and making sense of scholarly data, Rexplore, which leverages innovative techniques in large-scale data mining, semantic technologies and visual analytics. In addition to his professorial position at the Open University, he is also Editor-in-Chief of the International Journal of Human-Computer Studies and, over the years, has advised strategic research boards and governments in several countries, including UK, US, The Netherlands, Italy, Austria, Finland, and Estonia.